Renewable heating and cooling technologies - including air source and ground source heat pumps, solar thermal, and biomass heating - are increasingly seen as important solutions to a low-carbon future in the Northeast and Mid-Atlantic region. The Renewable Thermal Alliance (RTA) and Northeast Energy Efficiency Partnership (NEEP) invite you to a workshop to explore how the region can work collaboratively to accelerate the adoption of renewable heating and cooling technologies that will ultimately transform the way we heat and cool our homes and businesses. Utility Event: Con Edison will host a one-hour panel discussion on the company’s clean thermal initiatives, including the upcoming Con Edison Gas Innovation Program RFI to be released in June 2018. Please join the utilities for an informative session and refreshments before the event reception. 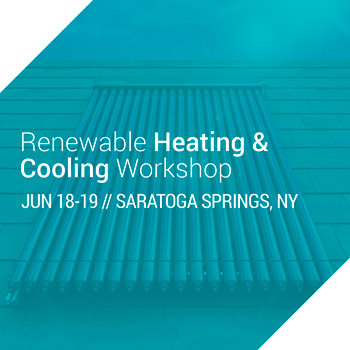 This workshop is an opportunity to participate in NYSERDA’s active market research focused on developing intervention strategies to overcome upstream and downstream finance-related barriers, animate the Renewable Heating and Cooling (RH&C) markets, encourage private capital and investment, and increase the scale and adoption of RH&C technologies throughout and beyond New York. Please join this session to hear more about the research to-date and join our interactive roundtable to share your perspectives and help prioritize opportunities for NYSERDA to engage the market. What program models are driving significant adoption of renewable heating and cooling? How do we spread effective models across the region? What are the barriers to widespread adoption? Where are we seeing successful installation of RHC technologies in the commercial and institutional sectors? How are RHC technologies being successfully deployed in district heating/cooling applications? Manufacturers accross technologies are welcome to participate into this session. Each will have a few minutes to present latest technologies in front of the audience. Where are we seeing successes/challenges in RHC Workforce recruitment? Where are we seeing successes/challenges in RHC workforce education and training? How do we leverage successful efforts to drive workforce development and training across the entire RHC market? How to diversify and build the future workforce? What explains deviations between ratings and in-field? What can be done to reduce those deviations and drive market growth? How can the region work together to support improvements to rating methodologies across RHC technologies? How does this collection of stakeholders continue to collaborate most effectively? Who will drive the workshop outcomes forward? A new initiative comprised of manufacturers and state and local governments—the Renewable Thermal Collaborative (RTC)—serves as a cross-sector coalition for organizations that are committed to scaling up renewable heating and cooling at their facilities and dramatically cutting carbon emissions. Founding members are Mars, P&G, Cargill, General Motors, Kimberly Clark and the City of Philadelphia. Please join this session for an introduction to the RTC and an interactive discussion on the different barriers and solutions to renewable options for thermal energy usage.